Life as a blogger is a busy life and it’s impossible to keep all those plates spinning, keeping on top of writing, social media and all those other tasks we need to do. 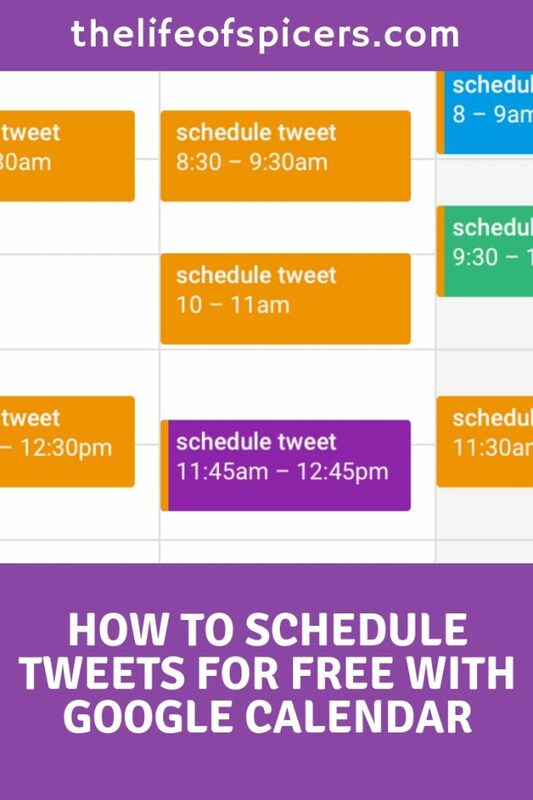 After trying out a variety of ways to schedule tweets, I have found out how to schedule tweets for free using Google Calendar. We’re going to be using Google Calendar to schedule out the tweets, so before you begin you will need a Gmail account that you have access to. If you don’t already have one, then you can create a free Gmail account. You will also need an IFFIT (If this then that) account. IFTTT is a service that allows all your apps to create a chain of statements calls applets. 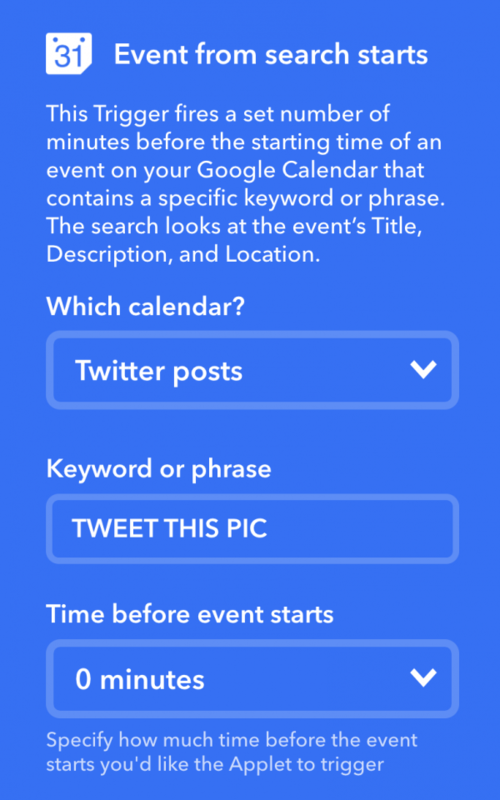 We will be using IFTTT to allow Twitter to talk to your Google Calendar. The last thing you will need is access to the Twitter account you wish to schedule the tweets for. First things first is to log into the Gmail account you are going to use and open the calendar. 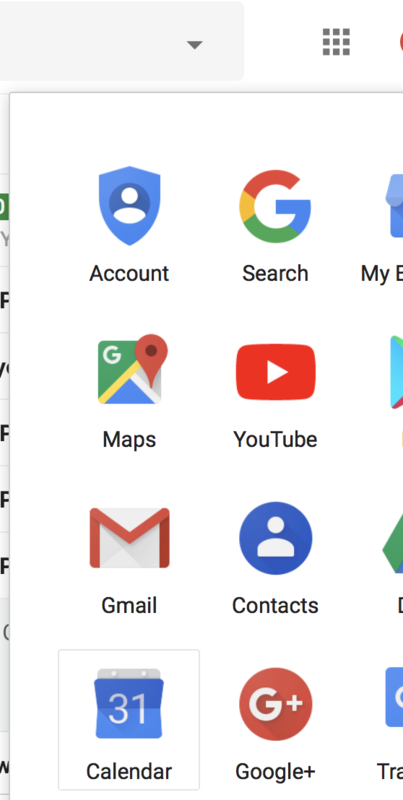 You can access this by selecting the Google apps icon in the top right of your inbox as shown below. With your Google calendar open, you can move across to IFTTT to select the applet we will need. In another window, log into IFFIT and select this applet – Schedule tweets using Google Calendar. 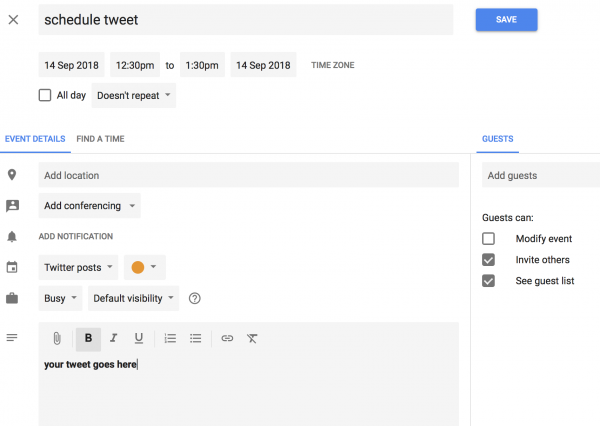 Turn the applet on and you will be prompted to log into and connect your Google Calendar and Twitter. Clicking OK will take you to a screen to log into both accounts. Follow the instructions on screen to sun both together. Your IFTTT applet will now have some configuration options a shown below. I added a calendar option from my Google Calendar called Twitter posts however this isn’t mandatory. This just helps me stay organised. The keyword or phrase you set here is the same phrase you will use when you schedule a new tweet from the calendar later. Schedule tweet works well as it does exactly what it says here. The time frame before the applet will trigger is set to fifteen minutes. When you schedule a tweet with an hours window in your calendar later, I find that fifteen minutes is a good gauge for setting the applet. There will never be an exact time your tweet will be published, but it will be within the time frame you set on your Google calendar. Once you have these setting, click SAVE at the bottom of the screen. Now it’s time to go back into your Google Calendar and schedule your first tweet. Select a time slot to schedule your tweet and double-click to open the edit screen. 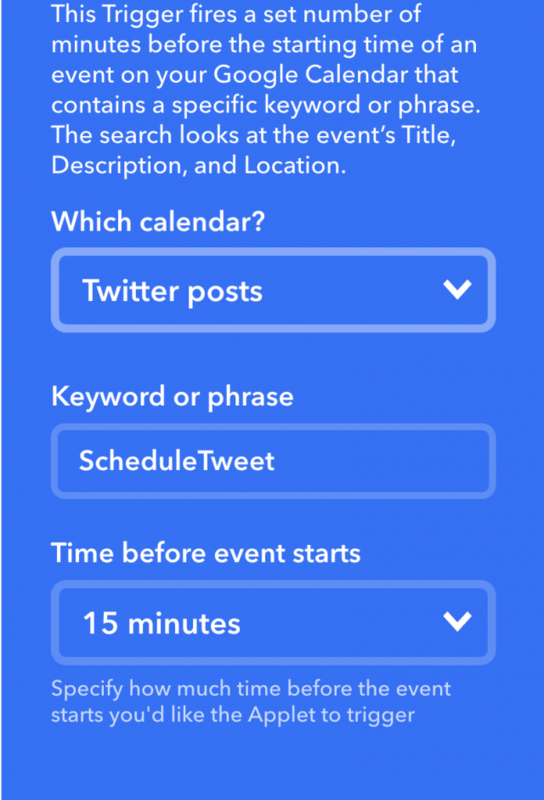 In the top line you will be adding SCHEDULE TWEET as we set up in the IFTTT applet just now. You can ignore all the other boxes apart from the description box at the bottom. This is where your tweet wording and link will go. The only thing you have to be mindful of here is the character length of your tweet as if it’s too long for Twitter guidelines then the tweet won’t publish. If you would like the tweet to repeat at certain intervals you can use the doesn’t repeat drop down box to change to suit your requirements. I find it useful to change the colour which defaults to Orange to suit what I am tweeting. This is just for my own personal organisation, but for example any blog posts I leave as Orange, any affiliate posts, I schedule in as Green etc etc. 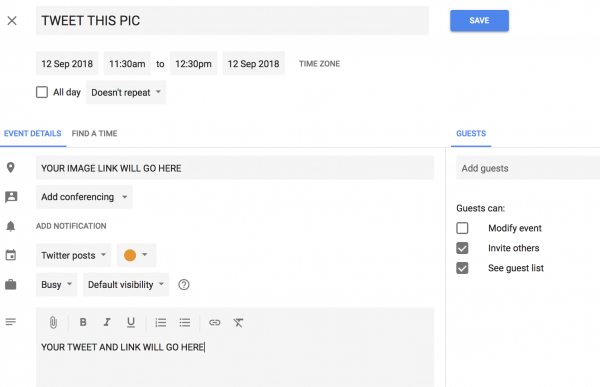 When you’re done, click SAVE in the top right and it will populate into your Google Calendar. If you like your tweets to be published with an image, you can also do this. You will need to sync a different IFTTT applet – Scheduling out repeat tweets with images using Google Calendar. As per the instruction at the top of this post, sync the applet, turn it on and check the settings for your calendar options. The difference here is instead of using the words Schedule Tweet in your keyword or phrase, you will be using TWEET THIS PIC. Click SAVE at the bottom of the applet and it’s time to set up your first tweet with an image. Upload your image and all we then need is the link to the image. You can find this by selecting the far left arrow icon as shown below from the top right of the screen. Select GET LINK from the options and copy the link to your image. Back into Google Calendar and we need to select the time for the tweet and bring up the edit screen again. This time we will add a different option to our tweet. Your keyword at the top of the edit screen will now be TWEET THIS PIC as per your setting in the IFTTT applet just now. In the location box you will paste the link to your image you just uploaded into your Google photo drive. The description of the tweet and link will be in the same box as before. All other options for repeating are the same as scheduling without an image. 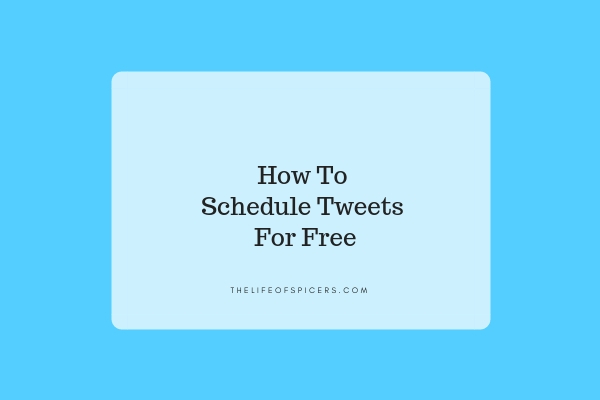 After looking for lots of different ways on how to schedule tweets for free, I have been using this method for a few months now, and it’s the easiest service I have found without being limited to only scheduling a few a day without paying to upgrade my account.